The story of the Kronstadt revolt, compactly told, a decisive moment in the Bolshevik counter-revolution. Since this pamphlet was written Israel Getzler's book Kronstadt 1917-1921: The Fate of a Soviet Democracy, Cambridge University Press, 1983, has appeared. Getzler studied the Russian archives to determine the truth of the Bolshevik claim that the social composition of Kronstadt had changed greatly since 1917. He found that 75.5% of the sailors were drafted before 1918. Over 80% were from Great Russian areas, 10% from the Ukraine and 9% from Finland. 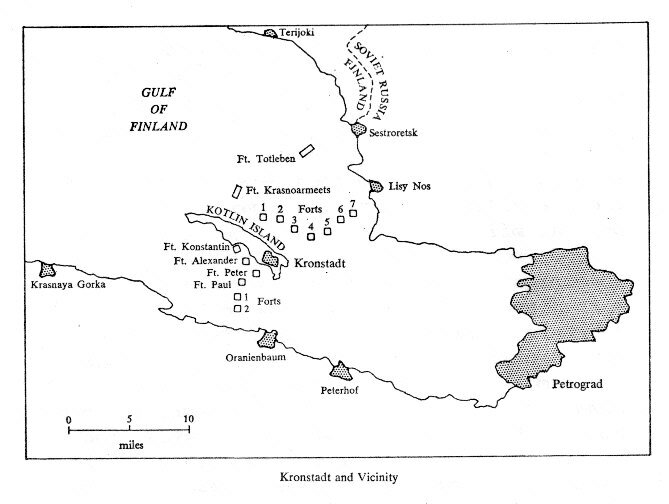 According to Getzler, "the veteran politicised Red sailor still predominated in Kronstadt at the end of 1920." "Getzler draws attention to the continuity in institutions, ideology, and personnel linking 1921 with 1917. In doing so he demolishes the allegation of Trotsky and other Bolshevik leaders that the majority of veteran Red sailors had, in the course of the Civil War, been replaced by politically retarded peasant recruits from the Ukraine and Western borderlands, thereby diluting the revolutionary character of the Baltic fleet. He shows, on the contrary, that no significant change had taken place in the fleet's political and social composition, that at least three-quarters of the sailors on active duty in 1921 had been drafted before 1918 and were drawn predominantly from Great Russian areas." Despite distortions by others, the real nature of the Kronstadt Revolt can be seen in their published demands. Thorndycraft's pamphlet was published by Left Bank Books, Seattle, USA, late 1970s(?). Shortly after the Russian Civil War, or as the Bolshevik view would have it, as a final chapter of the Civil War, there occurred an uprising at the Kronstadt Naval Base. The sailors whom Trotsky had dubbed "the pride and glory of the Revolution" rose in revolt against the very state they had helped into power. For sixteen days their "rev­olutionary commune" functioned independently of, and was bitterly attacked by, the "Workers' and Peasants' Government." It finally subdued them with thousands of casualties on both sides. But it was a Pyrrhic victory for the Communists. In a moment of sad honesty, Lenin called Kronstadt "the flash which lit up reality better than anything else." The continuing crisis provoked peasant risings all over Russia. (The Cheka reported 118 inci­dents in February 1921 alone.) The cornerstone of Lenin's policy of War Communism was the for­cible seizure of grains from the peasants by armed detachments from the cities. "We actually took from the peasant," admitted Lenin, "all his sur­pluses and sometimes not only the surpluses but part of the grain the peasant needed for food. We took this in order to meet the rejuirements of the army and to sustain the workers. "(2) Grain as well as livestock was often confiscated without payment of any kind, and there were frequent complaints that even the seed needed for the next sowing had been seized. In the face of all this, the peas­antry resorted to both passive and active resist­ance. In 1920 it was estimated that over a third of the harvest had been hidden from the govern­ments troops. The amount of sown acreage dropped to three-fifths of the figure for 1913, as the peasants rebelled against growing crops only to have them seized. As the civil war subsided and it became appar­ent that a White restoration was no longer a threat, peasant resistance became violent. The demobilization of half the Red Army - two and a half million men - swelled the peasant ranks with experienced fighters who constantly clashed with the requisitioning detachments. They demanded an end to the forced seizures of grain, and called for a fixed tax and the right to dispose of surpluses as they saw fit. But the regime's ideological dis­taste for such "petit-bourgeois aspirations", com­bined with fears of a resumption of foreign inter­vention, led to a stubborn continuance of War Com­munist policies. In most cases the confiscated stuff was divided by the defenders of the Communist State among themselves. The victims were fortunate indeed if they escaped further trouble. After they were robbed of their precious pack, they were often thrown into gaol for "speculation." A new bureaucracy had begun to flourish. It was a mixed lot, veteran administrative personnel rubbing shoulders with untrained neophytes; yet however disparate their values and outlook, they shared vested interests of their own that set them apart from the workers at the bench. "Strikes under the dictatorship of the proletariat!" the official exclaimed. "There is no such thing." A complete change is necessary in the pol­icies of the government. First of all, the workers and peasants need freedom. They don't want to live by the decrees of the Bolsheviki: they want to control their own destinies. It was a call thoroughly in the spirit of October and it aroused the full sympathy of the Kronstadt sailors. Kronstadt is a fortified city on Kotlin Island in the Gulf of Finland. Thirty kilometers west of the Petrograd, it defends the former capital and is also the main base of the Baltic Fleet. Numerous forts dot the water to the north and south of the island, and there are major additional fort­ifications on the mainland at Krasnaya Gorka and Lissy Noss. Together the Soviet and the forum in Anchor Square satisfied the political needs of Kronstadt's inhabitants. There seems to have been no widespread desire for a national par­liament or for any other central ruling body. For the most part, the social and economic life of the city was administered by the citizens themselves, through the medium of local committees of every sort -house commit­tees, ship committees, food committees, factory and shop committees - which throve in the prevailing libertarian atmosphere. A popular militia was organized to defend the island from any outside encroachments upon its sovereignty. Kronstadt's residents displayed a real talent for spontaneous self-organization. Apart from their various committees, men and women working in the same shop or living in the same neighborhood formed tiny agricultural communes, each with about fifty members, which undertook to cultivate whatever arable land could be found on the empty stretches of the island. During the Civil War, says Yarchuk, these collective vegetable gardens helped save the city from starvation. But the sailors began to exhibit at best mixed feelings toward the Bolshevik regime within months of Lenin's seizure of power. In April 1918 they passed a resolution calling for replacement of the Bolsheviks by a genuinely revolutionary regime. In October they attempted a mutiny. As the Civil War unfolded, however, once more Kronstadt sailors were some of the best fighters against the Whites. They were sent to all the most precarious fronts, partly due to their ability, and perhaps also, as Voline maintains, because dead heroes - or at least widely dispersed heroes - were of more value to the Bol­sheviks than were live and very volatile champions of direct democracy. Thousands of casualties, combined with a centrally imposed reorganization of the Red Fleet might provide the Communists a more passive Kronstadt. As for Trotsky's charge that the Kronstadt rebels of early 1921 were morally degenerate "self­seekers," the regime itself put the lie to that. As late as November 1920, on the third anniversary of the October Revolution, the Kronstadters were again held up as an example of revolutionary reliability. "It is true," says Nicolas Walter, "that by 1921 the social composition of the fleet had changed; [see our introduction for more recent definitive clarification by Getzler on the actual continuity of social composition since 1917 at Kronstadt] instead of being mainly workers from the Petrograd area, the sailors were now mainly peasants from southern Russia. But far from this making them any less revolutionary, their personal links with such areas as the Ukraine if anything raised their revolutionary consciousness..."(11) But the Communist bureaucracy, burdened with its conviction that it alone embodied the Revolution, could only respond to the groundswell of peasant, worker and military unrest in 1921 with cries of "counter-revolution!" 15. To permit free handicrafts production by one's own labor. The most immediately striking thing about this document is that only one demand - for the abolition of political departments in the fleet -relates specifically to the sailors' situation. All the other points were made on behalf of the rebelling workers and peasants. Furthermore, Trotsky's charge that the Kronstadters were demanding spec­ial food privileges is belied by the call for equalization of rations; Lenin's claim that they had called for the return of the Constituent Assem­bly is unsubstantiated by this, or any later, document. (13) The seamen had dispersed the Assembly in 1918 and they were no more favorable to it in 1921; in their eyes, explains Avrich, a national parliament would inevitably be dominated by a new privileged minority. Various attempts have been made to "type" the Kronstadt rebels on the basis of this resolution and subsequent publications. Isaac Deutscher states flatly that they were led by anarchists, an assumption he derives from Trotsky. Nicolas Walter disputes this, since "They envisaged a strong ad­ministration and wanted a 'soviet republic of toilers' based on councils of working class deputies exercising state power. "(14) Certainly the Mensheviks, the Right Social-Revolutionaries and the middle-class liberal groups were not in favor: the call for freedom of speech and assembly was only for "anarchists and left-socialist parties. "(15) Avrich appears to be correct in saying that the rebellion was neither inspired nor engineered by any single party or group. The Kronstadt rebels were pure soviet communists, whose aim was to re­turn to the brief triumph of the October Revolu­tion - "to the hours, as it were," says Nicolas Walter, "between the disappearance of-the Provi­sional Government and the appearance of the People's Commissars." But the government seems to have never seriously entertained the thought of negotiation with the sailors. There are a number of reasons for this. First, the Communists half-believed in their own charge that the uprising was inspired and supported by White emigres, and was the stepping stone to a new intervention. Had this been true, there was probably no better stepping stone than the Kron­stadt naval base, with its heavy armaments and its proximity to Petrograd. There is plenty of evidence of elation among the Russian emigres, but as we have seen, Kronstadt's program was hardly designed for their sakes, and it seems more a case of wishful thinking. White organizations in Europe began rounding up supplies for the sailors as soon as the uprising began, but in fact none were actually delivered, nor were they solicited. That there was at least some legitimate basis for the Kronstadt reform demands was admitted by Kalinin.... He described a resolution adopt­ed at Kronstadt on March 1, demanding various reforms ranging from free elections to the permission of free trade, as "with certain corrections, more or less acceptable," and based on real organizational abuses within the Communist Party. Undoubtedly the Kron­stadt revolt could have been forestalled by timely reforms, but such a course would have been too embarrassing and might well have been a serious blow to the authority of the government.... Given the state of discontent, an admission by the government that the Kron­stadters had a case that could be discussed, might have brought the Soviet regime crashing down everywhere. It was essential above all for the Communist Party to suppress the idea of Kronstadt as a movement which defended the principles of the October Revolution against the Communists--the idea of the "third revolution." Finally, Kronstadt posed a new and disconcerting problem for the regime. Communist Party members in the Baltic Fleet had, in mid-February, condemned the Political Section of the fleet; they had fur­thermore, according to the Commissar for Petrograd, been leaving the party in droves - 5000 sailors in January alone. (21) During the uprising, so many Communists were writing to the rebel Kronstadt Isvestia to announce their resignations that the editors had to plead for shorter statements. The central government couldn't negotiate with these rank-and-file defectors at a time when it was about to ban dissent even at its highest levels. The military strategy of the Kronstadters was entirely defensive, a reflection of their illusion that they had merely to wait and the rest of Russia, starting with Petrograd, would rush to their sup­port. They ignored the suggestions of military officers to break up the ice around the island with cannon fire, which could have prevented an assault by land. They further rejected the idea of seizing the fortress of Oranienbaum, from which they could have launched a surprise offensive. Had they done so, they would have saved the lives of the aerial squadron at Oranienbaum, which was caught in a plan to join the rebels. Several Red Army regiments at Oranienbaum also refused to fight the sailors. Cheka units rushed to the scene and shot every fifth soldier. On largely ideological grounds, the sailors de­clined outside help in the form of supplies, thus dooming themselves to slow starvation. But they most gravely miscalculated the situation in Petro­grad. The strikes in Red Peter were already de­clining as the Kronstadt uprising began. Through a combination of repression and concessions - most notably the removal of roadblock detachments - the city was calmed. Hundreds of dissident workers had been arrested and all soldiers suspected of sympathy with Kronstadt were transferred further inland. Kronstadt was alone. Following acceptance of the Petropavlovsk reso­lution in Anchor Square, a "Provisional Revolution­ary Committee" had been elected to coordinate Kron­stadt's affairs pending the formation of a new Soviet. This group of fifteen--nine sailors, four workmen, one school principal and a transport of­ficial--were soon catapulted into the role of military strategists. On March 4, at a heated session of the Petrograd Soviet, Zinoviev demanded the immediate surrender of Kronstadt on pain of death. The rebels were passionately defended by a Petrograd worker-delegate: "It's the cruel in­difference of yourself and of your party," he shouted at Zinoviev, "that drove us to strike and that roused the sympathy of our brother sailors... They are guilty of no other crime, and you know it. Consciously you malign them and call for their destruction . "(24) Amid cries of "traitor" and "Menshevik bandit" he was drowned out and Zinoviev's motion was passed. Tukachevsky ordered a first attempt to take Kron­stadt by storm, on March 8. His troops advanced across the open ice with no protection against the guns of the base. They were prodded from behind by machine gunners who were instructed to shoot waver­ers. Hundreds were killed, many drowning in the holes made in the ice by Kronstadt's cannons. Following his total failure on March 8, Tuka­chevsky took time to attain troops less likely to display ambivalence at the crucial moment. From the Asiatic parts of Russia, he brought in men who had little in common with the Kronstadters. Three hundred delegates from the Tenth Party Con­gress (which was then in session) raced to the front. Some of these were Workers' Oppositionists, anxious to display their loyalty to the Party. Meanwhile the island entered a period of gradual starvation and demoralization. Their rebel Isvest­ia still urged Red Peter to rise in support, but they were less and less optimistic. Finally on the night of March 16, the last assault began. Avrich estimates that 50,000 Com­munist troops were pitted against 15,000 well-­entrenched defenders. By morning the battle raged within the city itself. Women as well as men fought ferociously to save Kronstadt, and at four in the afternoon they almost succeeded in a counter-offensive. But their own exhaustion and a fresh supply of Communist troops decided the day. Had they held out much longer, a plan sanctioned by Trotsky to launch a gas attack would have been carried out. There are a number of differing conclusions which may be drawn from the story of Kronstadt. The rebels were certainly not the "revolution's guiltless children," as Avrich calls them. The maturity of political thought revealed in the Petropavlovsk resolution should restrain us from condescension. The real argument revolves around what could loosely be called the issue of historical necessity. An added complication is that in a real sense, there are two "Leninisms" - one motivating the Kronstadters, the other justifying their sup­pression. "Socialism," said Lenin in 1917, "is not created by orders from above. State-bureaucratic automat­ism is alien to its spirit; socialism is alive, creative - the creation of the popular masses them­selves." Written immediately prior to October, State and Revolution called for freedom of the press, the abolition of "special bodies of armed men" in favor of a people's militia, a state in which the workers would exercise power directly through their elected soviets, and in which all left-wing parties could agitate freely. (1) Shub, David. Lenin. p. 405. (2) Quoted in paul Avrich's Kronstadt 1921. p. 9. (3) Op. cit., p. 26. (4) Quoted in Emanuel Pollack's The Kronstadt Rebellion. p. 2-3. (5) 0p. cit., p. 28-29. (6) Quoted in Pollack, op. cit., pp. 10-11. (7) Serge, Victor, Kronstadt 1921. p. 2. (8) Quoted by Alexander Berkmen: "The Kronstadt Rebellion," 1922, in Anarchy Magazine. (9) Leon Trotsky, from "Hue and Cry over Kronstadt," quoted by Anton Ciliga, Anarchy Magazine. (10) 0p. cit., p. 73-74. Voline is also an excellent source on Kronstadt's internal affairs. (11) Walter, Nicolas. From his review of Avrich's Kronstadt 1921, in Anarchy Magazine. (12) Avrich, op. cit., p. 73-74.
misunderstanding the real nature of the movement." Within the confines of Kronstadt itself, where "reaction­ary deceptions could have no success," all opinions could be freely expressed. Voline, op. cit., p. 473. (16) Op. cit., p. 25. (18) His arrest became a major issue in the battle of propaganda, with the Bolsheviks claiming he had been threatened with execution. Victor Serge recounts the incident as his first exper­ience with lying as an established policy of the regime. (19) Avrich has written an entire chapter on the complex question of White involvement. His conclusions seem fair, and I have reproduced their general tenor. (20)R. V. Daniels, The Conscience of the Revolu­tion, p. 144. (21) This figure is from Ida Mett's The Kronstadt Uprising, p. 37. (22) Serge, op. cit., p. 4. (23) Avrich describes one brief moment in this story, when the government offered to negotiate. Un­fortunately, the sailors distrusted the proposed negotiating team, and their request for an amended proposal was never answered. This all occurred the day after the wives and chil­dren of many sailors had been arrested as hostages on the mainland, a move which guaran­teed intransigence on the part of the rebels. (24) Avrich, op. cit., p. 143. (25) There is some suggestion that this phrase was Zinoviev's. (26) Avrich, ibid. The ninth is the culminating wave of a storm at sea. dered. No one trusts himself to speak." (27) Avrich, ibid., p. 152. (28) Quoted in Pollack, p. 40. (29) These figures are Avrich's. (30) Quoted in Pollack, p. 49. (31) Quoted in Pollack, p. 62. (32) The phrase is R. V. Daniels'. (33) Quoted in Daniels, op. cit., p. 136. (34) Ibid., p. 147. The "primeval Leninism" of 1902 is that expressed in What Is to be Done. (35) Walter, op. cit., p. 27. 1. Avrich, Paul. The Anarchists in the Russian Revolution. Cornell.U. Press, 1973. 2. Avrich, Paul. Kronstadt, 1921. Princeton U. Press, 1970. 3. Daniels, Robert V. The Conscience of the Revolution: Communist Opposition in Soviet Russia. Simon & Schuster, 1969. 4. Deutscher, Isaac. Trotsky. Vols. 1 - 3, Oxford U. Press, 1954, 1959 and 1963. 5. Goldman, Emma. Living My Life, Vol. 2. Knopf, 1931. 6. Goldman, Emma. My Disillusionment in Russia. Apollo Editions, 1970. 7. Goldman, Emma. Trotsky Protests Too Much. A pamphlet published by the Libertarian Education Project in England. 8. Mett, Ida. The Kronstadt Uprising. Black Rose Books, 1971. 9. Pollack, Emanuel. The Kronstadt Rebellion. Philosophical l.ibrary, 1951. 10. Serge, Victor. Kronstadt 1921. A pamphlet published by Solidarity, in England. 11. Shub, David. Lenin. Doubleday, 1948. 12 Voline. The Unknown Revolution. Solidarity/ Black and Red, 1974. 13, Oxford13. The Kronstadt Rebellion in the Soviet Union. A pamphlet published by the National Education Department of the Socialist Workers Party, 1973: articles by Trotsky, Wright, Serge, MacDonald, and the editors of New International. 14. Anarchy Magazine. March, 1971. The whole issue is devoted to Kronstadt and includes articles by Paul Avrich, Alexander Berkman, and Anton Ciliga.